What Do I Have In Common With Downton Abbey’s Lady Grantham? I don’t watch Downton Abbey; sorry to have to say this but I am slightly over all that costume drama Cranford/Lark Rise type of stuff though I know the world loves it, it exports well and it wins gongs in Hollywood which is entirely as it should be, well deserved what with all that talent involved in writing and acting and more. My entertainment needs these days are a good deal more contemporary, though my programmes also win Golden Globes, don’t miss Homeland. I still like to keep my finger on the pulse of popular culture, so I did read the story over Christmas about Lady Grantham, as played by Dame Maggie Smith, not knowing what a weekend was and I thought this was mildly amusing and something we have in common. Ha! When was the word weekend introduced I wonder? Ah, a swift Google search reveals it isn’t a very old word in the great scheme of things. Since I started on my gap year just over a year ago, I have been struck by how weekends are no longer any different to my weeks. People say “what are you doing this weekend?” and I reply that a weekend no longer has any significance for me and I pretty much do the same as I do in the week, i.e. not work. To be honest with you, after a while it just got on my wick. I don’t really like have to explain things to people, I like them to just keep up. And yes, I do realise that that’s completely unreasonable on my part as it’s not their reality. Yet. Though it will be if I have anything to do with it for my clients and only if that’s their goal too. And then I read this fun and fuss in the Christmas papers about Lady Grantham expressing surprise at the word ‘weekend’ and asking what one was because, of course, Lady G doesn’t have to work either. Difference between her and me is, she never did, whereas I’ve done 40 years hard labour and am only taking a breather. Then last week, someone was asking me what I did at weekends (sigh) and I said – well you know what I said by now, and she said “you sound just like Lady Grantham!” which I enjoyed actually. 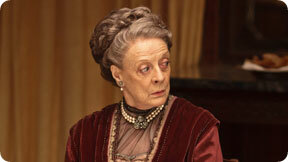 It seems some of her bon mots are what drive audience enthusiasm for Downton Abbey, am I wrong? In which case this is a compliment and a funny one at that. Would you like your weeks to be more like your weekends? You know who to call. Check out some more fab Grantham zingers here.